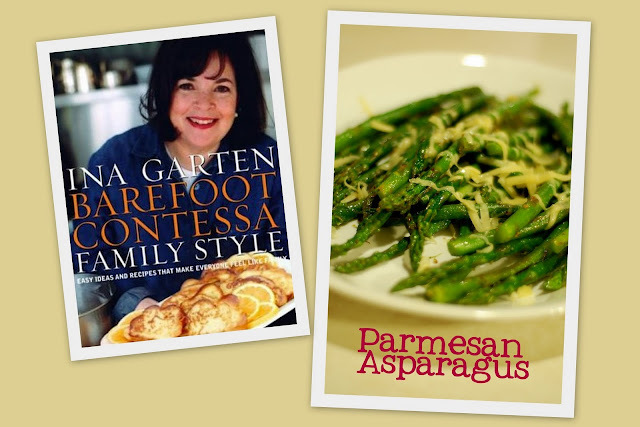 The recipe that inspired today's By the Book Friday Post comes from Ina Garten's Barefoot Contessa Family Style. It's no secret that I have a big crush on Ina and she really can't do any wrong in my eyes. I'll admit that I didn't follow the recipe exactly, as she roasts the asparagus and my oven was full at the time (oh, to have a double oven!) So instead, I blanched the asparagus by cooking them for two or three minutes in boiling water, then stopping the cooking by covering them with ice water. Then I crisped them up in a hot skillet with a little butter and olive oil and added the rest of the flavors in Ina's recipe- kosher salt, freshly ground pepper, generous Parmesan cheese, and lemon juice. It just takes a couple minutes and the final product is really fragrant and delicious (even my little man ate these up). And like I said, you can use fresh green beans instead- either makes a delicious spring dinner side dish. Do you have any Easter favorites that you make every year? I hope you have a wonderful Easter weekend! Preheat the oven to 400 degrees F. (note- I blanked them instead, so I boiled a large pan of water to begin). If the stalks of the asparagus are thick, peel the bottom 1/2 of each. Lay them in a single layer on a sheet pan and drizzle with olive oil. Sprinkle with salt and pepper. Roast for 15 to 20 minutes, until tender. Sprinkle with the Parmesan and return to the oven for another minute. Serve with lemon wedges. Variation: Instead of roasting in the oven, I blanched the asparagus for three minutes in salted boiling water. Next, submerge the asparagus in ice water to 'shock' it. Transfer to a skillet warmed over medium high with a couple tablespoons of olive oil or butter and brown for just one or two minutes. Then season and garnish as above, with salt, pepper, sliced Parmesan cheese, and the juice of half a lemon. Serve immediately.